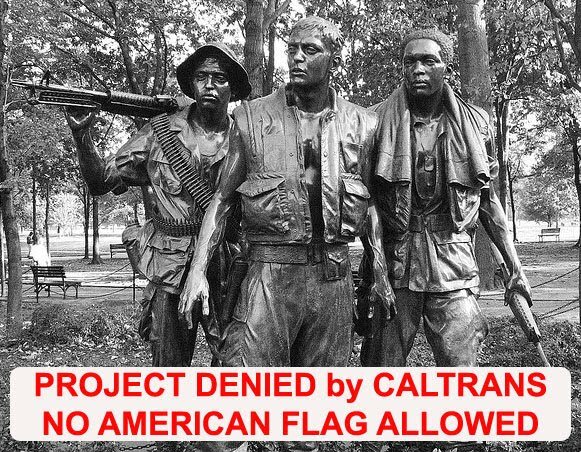 Our community’s Veterans’ recognition project was denied on March 7, 2011, because the California Department of Transportation determined that the American flag is political speech. And now the California Department of Transportation is ordering me to remove “United States” and “E Pluribus Unum” from the Emblem of the United States Army, and “United States” and all mottos from all United States Military emblems. E Pluribus Unum is the same motto that is on the Seal of the President and Vice-President of the United States of America, the Seal of the United States Congress, the Seal of the United States Senate and the Seal of the United States Supreme Court and the Great Seal of the United States of America (carried by the American Bald Eagle). 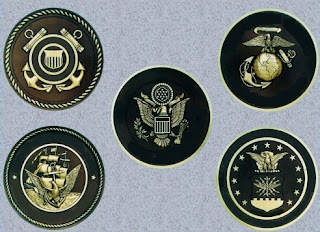 These Seals and emblems are works of art that are the property of the United States of America. E Pluribus Unum was the motto suggested by the committee appointed on July 4, 1776 by the United States Congress. This motto is a very important part of our United States history. In July of 2011, I came to you looking for answers (see attached letter dated July 25, 2011). The impasse that I reached was that the California Department of Transportation had determined that the American flag was political speech (see attached letter from you dated August 31, 2011) and our civic group was denied a California Department of Transportation Gateway Monument encroachment permit. In my letter I stated “Under the Caltrans Transportation Art Program the Caltrans approved “Chicano Park” in San Diego. I understand that one of the murals in this Caltrans approved Transportation Art project includes Fidel Castro.” Therefore, I suggested that we resubmit the project as a Department of Transportation art project. You responded “we encourage you to submit an application with specifics in order to determine if the “granite pillar” monument you describe could be accepted as a Caltrans art project and therefore a mutually acceptable approach”. On September 16, 2011, I resubmitted the project as transportation art. The only thing that I changed was I removed the American flag from the center of the project because I knew that the project would be denied. The permission was granted from each branch of the United States Military, and submitted to Caltrans on April 3, 2012. The letters of permission included a graphic of the respective emblem and each branch of the United States Military authorized use with strict instructions. Example - “The Army Symbol or any part of its elements cannot be altered in any manner.” “Army trademarks are exclusive property of the United States Army” (Please see the attached Permission letter from the United States Army). The permission letters from the other branches of the United States Military were similar in text. “I understand that you are anxious to get going on this and that you want to use the Seals as a fund raising incentive but I think you are getting too far ahead of the process too quickly. The issue of “text” both on the seals and on any sponsorship plaques should be resolved first. I don’t recommend you spend any money until we know exactly what will be approved. The initial response to my inquiry with headquarters was that no text would be allowed on any part of the artwork which would include on the seals as this is the policy-you already asked the plaque company to remove the text – thank you” No, I did not. She is referring to the email below from me to the foundry that she was copied on concerning the use of “Department of” – I just want to be sure they understand it means all text). I am still looking into the sponsorship names idea (pavers or plaques) to see how much latitude there is on that since it seems like you are anticipating a lot of names. Until we know for sure on this I would hold off ordering the seals. On January 9, 2013, I sent the following email to the Foundry casting the bronze emblems that Caltrans was copied on. Dave, Please give me an updated price quote for the United States Marines, United States Army, United States Coast Guard, United States Navy and the United States Air Force 18" Bronze Modeled Seals. Please include shipping charges to Santa Maria, California 93455. I understand that the Modeled Seals for the United States Navy and the United States Air Force contain the text "Department of the Air Force" and Department of the Navy". And that the Modeled Seals for the Army, Marines and Coast Guard DO NOT contain "Department of the..." (attached is modeled military seals jpg that you previously sent to me). These seals are being used in the Old Town Orcutt - Caltrans Transportation Art Project - “A Tribute to the Protectors of Freedom". The California Department of Transportation required me to get permission from each branch of the United States Military to use their seals in the project. I have gotten permission from the Army, Navy, Marine Corps, Coast Guard and Air Force with the one requirement that the seals DO NOT contain "Department of the". I understand that you will have to make new molds to cast the seals for the Air Force and the Navy to meet these requirements and that there is an additional cost for this. I would like to keep Ms. Corby Kilmer from Caltrans in the loop during this ordering process so that she is assured that the seals being ordered meet the above requirements. Please also let me know how long it will take to process this order and if the Army, Marines and Coast Guard seals can be shipped out sooner. We would like to use these seals in our upcoming fundraising events. I'm doing a bit of catch-up with your emails...Yes, in my initial discussion with HQ they required all text be removed. I went back to them with the photoshop sketch and pointed out that without any 'labels' you can't tell which seal is which, so we reached a compromise - that technically the columns will be the art piece and that I could allow the seals to be considered a part of your sponsoring 'plaque' so long as the 'labels' were minimal (the branch name only), and that text could not be seen directly from the street (seals facing into the circle). You can still have a small rock with a plaque that has the title of the art piece too.” “No mottos, just branch names”. On January 28, 2013, I copied Caltrans District 5 on a message that I sent to the County of Santa Barbara. I included a photograph, of a full scale model of one of the columns, that I wanted to bring to the February 19, 2013 Board of Supervisors meeting. 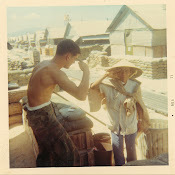 The American Legion, the Vietnam Veterans of America, the United States Marine Corps League and the Veterans of Foreign Wars have all submitted letters of support for this project, representing over 1,000 local Veterans (see attached letters). And they all agree, NO “UNITED STATES”, NO “E PLURIBUS UNUM”, NO DEAL. Issue number two is with us wanting to use plaques for donor recognition and the Caltrans insisting on us using pavers on the ground because they would be less visible. Caltrans policy allows for the names of sponsors to be on plaques attached to the columns i.e. ; art work. Why will the Caltrans not allow the Veterans names to be on the plaques if they are the ones sponsoring the art work? Why do their names have to be on the ground and “not be readily visible”? These pavers will end up with bird feces, dirt and grime on them. Part of this process requires the County of Santa Barbara, Board of Supervisors to adopt a resolution. This Veterans recognition project is on the agenda for the County of Santa Barbara, Board of Supervisor’s meeting on February 19, 2013. I have submitted a letter (see attached) asking for the Supervisors support as well as the letters from the five Veterans groups. My letter makes a case for the California Department of Transportation to accept our Veterans recognition project as designed without violating any department policies. I hope that we can come to agreement that the United States Military emblems are the property of the United States of America, that the emblems or any part of their elements cannot be altered in any manner, and that in using the emblems and plaques in this project “United States” “E Pluribus Unum” and Veterans names on plaques is not considered “text”. I am asking for your support of the Old Town Orcutt Veterans Recognition Project - “A Tribute to the Protectors of Freedom”. This community project is located across the street from the on-ramp to Vandenberg Air Force Base. Many active duty military and Veterans pass by this area daily and will greatly appreciate this symbol of gratitude from our community. This is a California Department of Transportation Art Program project. The Transportation Art Program provides a way for the California Department of Transportation to permit enhancement of existing transportation facilities with local communities and artists within the State right-of-way, through the encroachment permit process. This is a privately funded project sponsored by the Old Town Orcutt America Legion Post 534. Transportation art located within the California Department of Transportation’s right-of-way is considered a benefit to the people of California and will become property of the State. California Department of Transportation policy supports and encourages the concept of enriching the cultural and visual environment of transportation system users and local communities by facilitating and coordinating the placement of artwork by others. Transportation Art may include graphic or sculptural artwork, either freestanding or placed on required engineering features that expresses something special about a community’s history, resources or character. This project is a collaboration between the California Department of Transportation, the County of Santa Barbara and the American Legion. It will enhance and reflect the aesthetic, environmental, scenic, and cultural values of Orcutt, California, meeting the goals and expectations of both the local community and the public-at-large. In negotiations for this Veterans’ recognition project the California Department of Transportation headquarters will allow the names of Veterans (donors) to be placed on pavers located on the ground. I find this to be disrespectful as these pavers end up with bird feces, dirt and grime on them. I requested that bronze plaques be allowed to be placed on the columns with the name(s) of sponsor(s) on them. This would add to the beauty of this Veterans recognition project, especially considering that many of the sponsor(s) are Veterans themselves. The California Department of Transportation policy supports this request (see above). This project incorporates five 18” bronze military emblems representing the United States Army, the United States Marine Corps, the United States Navy, the United States Air Force and the United States Coast Guard. The California Department of Transportation authorized the use of said emblems over one year ago, with the only provision being that the project artist get permission from each branch of the United States Military, to use their respective emblem(s). That permission was granted from each branch of the United States Military, the letters of permission included a graphic of the respective emblem and each branch of the United States Military authorized use with strict instructions. The United States Army Emblem includes “UNITED STATES ARMY” and the motto, “E Pluribus Unum”. This is the same motto that is on the Great Seal of the United States of America (carried by the American Bald Eagle), the Seal of the President and Vice-President of the United States of America, the Seal of the United States Congress, the Seal of the United States Senate and the Seal of the United States Supreme Court. These Seals and emblems are works of art that are the property of the United States of America. The Director of the California Department of Transportation considers the flag of the United States of America to be a political symbol “cannot engage in government speech by displaying political symbols, such as flags on Caltrans property” (please see attached letter from the Director of the California Department of Transportation, dated August 31, 2011). I strongly disagree, that the flag of the United States of America, that unites all of us, is a political symbol. The Orcutt community’s roots are saturated with American Veterans, they elevate our moral fiber and they deserve our upmost respect. This wonderful project honors all American Veterans. American Veterans are a rare breed, they are the ones that stand up and say I will die, not only for my freedom but for your freedom. I hope that you and all of the County Supervisors will stand as tall for this project as our Veterans have stood for all of us, in the name of freedom. Our non-profit civic group is trying to build a gateway monument project in Orcutt, California. We submitted our plans to Caltrans in February of 2011 and the Caltrans District 5 Encroachment Permit Engineer denied our project in a letter dated March 7, 2011. Senator Tony Strickland introduced Senate Bill No. 443 on March 24, 2011. The original bill would have allowed us to build our memorial under Caltrans supervision. The Senate Appropriations Committee amended Senate Bill No. 443 on May 31, 2011. Currently the bill states: Pursuant to Section 118 of the Streets and Highways Code, the Department of Transportation may sell excess real property in the state-owned area associated with the park-and-ride lot at the Clark Avenue West exit from State Highway Route 135 in the Town of Orcutt to the County of Santa Barbara for purposes of erecting a veterans' memorial at that location. The decision to amend this bill was based on the Senate Appropriations committee bill analysis which states: In Brown v. California Department of Transportation (260 F.Supp.2d 959) the U.S. District Court ruled that Caltrans violated First Amendment rights of expression by prohibiting unpermitted anti-war displays of expression on highway overpasses, while allowing the display of United States flags. The decision requires Caltrans to enforce its permitting and maintenance rules and regulations on a content neutral and viewpoint neutral basis. Rather than allow all forms of expressive activity on highway overpasses, Caltrans policy is to allow no displays of expression in Caltrans right-of-way. Our project has nothing to do with Brown v. Caltrans and hanging flags on overpasses. I had a highly regarded legal foundation that has won several major cases in the United States Supreme Court review my contention and they agreed with me. They determined that the Supreme Court case of Pleasant Grove v. Summun more appropriately applied in this situation. During the course of interactions that have taken place over the last six months between State Senators and Assemblymen, U.S. Congressmen, County Supervisors, Veterans Groups and the public the California Department of Transportation went back and forth as to their problem with our project being the flag of the United States of America or the Veterans’ Memorial or both. I submitted a second encroachment permit on May 23, 2011 to put a flagpole and the United States flag in the State Right-of-way. 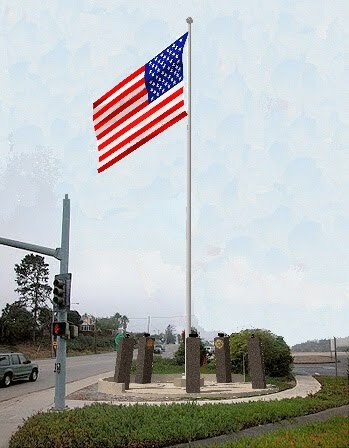 The Caltrans Gateway Monument Program does not allow any flagpoles or flags. 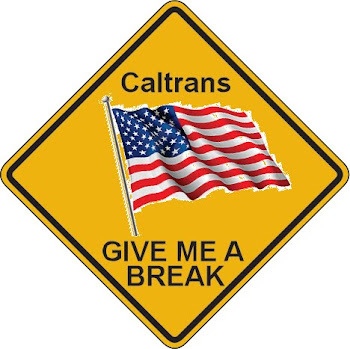 The Caltrans Encroachment Permit Manual and California State law allows the California State flag and the flag of the United States of America in the State Right-of-way. 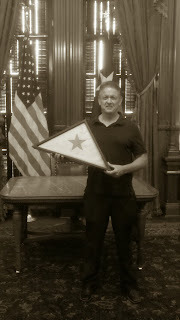 Our permit was approved and the United States flag was displayed for the first time on July 4, 2011. I hereby request that the California Department of Transportation revise the “Gateway Monument Program” guidelines to allow the California State flag and the flag of the United States of America. On June 2, 2011, Senate Bill No. 443 unanimously passed the California Senate 39 to 0 and was ordered to the Assembly. In mid June, 2011, I received a call from California Senator Tony Strickland’s office concerning the Bill. I contacted Mr. Pittarelli and I was told that the property would be sold to the County of Santa Barbara for a nominal fee. He did not know if that would be $1.00, $5.00 or $500.00 but he surmised that the property did not have much value because of its small size and location. I agreed. Mr. Pittarelli told me that he would contact me once he received his orders from Caltrans in Sacramento as they were still deciding on how to handle the process. I called Mr. Pittarelli on July 18, 2011 to see if he had heard from Sacramento. He told me that he had sent a letter to me and that he would email me over a copy of the letter. In our July 18th conversation, he said that there was going to be a $10,000.00 fee that was going to have to be paid upfront before the process of selling the property to the County of Santa Barbara was started. This took me by surprise and I told him that I would have to see the letter so that I could determine how we were going to proceed from here. I then called Mr. McGolpin and asked him to email me a copy of the letter that Mr. Pittarelli had sent to me. In talking to Mr. McGolpin he said that he was under the same impression that I was, the property would be sold to the County of Santa Barbara for a nominal fee. No one had mentioned a $10,000.00 fee to him either. The Old Town Orcutt Revitalization Association is a non-profit civic group of citizens that has worked very hard to raise the funds and pledges that we needed to build our Veterans’ Memorial. Over the last 10 years our organization has implemented many beautification projects. Our work has inspired the community to invest in their homes and businesses and to show community pride. We are willing to pay a nominal fee for this property. We are not able to pay $10,000.00 for your process. I would like it noted that if our original “Gateway Monument” encroachment permit had been approved there would not have been any Caltrans fees attached to our project. This is true for any non-profit civic group wanting to build a gateway monument. I would also like it noted that the County of Santa Barbara 4th District Supervisor Joni Gray recently pointed out to me that the Caltrans is taking property from the County of Santa Barbara “with no compensation” for a roundabout located at Highway 246 and Purisima Road. In a letter dated July 8, 2011, from the Caltrans to the County of Santa Barbara, Caltrans transportation surveyor Timothy Romano noted that Sections 81-83 of the Streets and Highways Code give the Caltrans the authority to take property from the County with no compensation to the County. If in fact this property is within the boundaries of the state highway, then the authority rests in Section 80 of the Streets and Highways Code requiring a California Transportation Commission resolution. I request that 1. if the County of Santa Barbara agrees with me and 2. if the Caltrans has not received the required resolution from the California Transportation Commission for the State Highway 246 Purisima Road Roundabout, then the Caltrans exchange (see excerpt from Senate Bill No. 443 below) the property they need for the State Highway 246 Purisima Road Roundabout for the property that we need for the Veterans’ Memorial. California Senate Bill No. 443 as currently amended states in part: Under existing law, if the department determines that real property is no longer necessary for highway purposes, the department may sell or exchange the real property based on terms established by the California Transportation Commission. In the meantime, I will be contacting Senator Tony Strickland’s office to discuss moving Senate Bill No. 443 back to the required California Assembly committees and on to the Governor for his signature. I will be contacting California Legislators, the U.S. Congress, the American Legion, the VFW, the United States Marine Corps League, the County of Santa Barbara and the public to ask for their help. Under the Caltrans “Transportation Art Program” the Caltrans approved “Chicano Park” in San Diego. I understand that one of the murals in this Caltrans approved “Transportation Art” project includes Fidel Castro. If we were to re-submit our project as a Caltrans Transportation Art project, would you support our project? The project would include five black granite pillars representing each branch of the United States Armed Forces (bronze insignias), a 30’ concrete circular walk (sidewalk), a flagpole with the flag of the United States of America in the center of the circular walk (sidewalk). This should comply with the Caltrans Encroachment Permits Manual and California State law. We would call the Transportation Art Project “A Tribute to the Protectors of Freedom”. Please help me spread the good news. 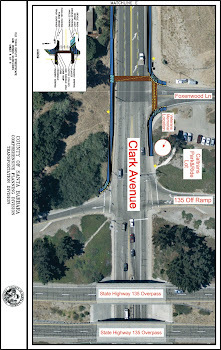 Caltrans has approved OTORA’s permit to fly the American flag in the State right-of-way (State Highway 135 & Clark Ave). We will officially raise the American flag on July 4th at 9:00 a.m. This interim flagpole came from the Orcutt School District. It is a 30’ tall wooden pole that has been refurbished. According to Caltrans the process is underway to sell this small piece of property for the Orcutt Veterans’ Memorial to the County of Santa Barbara for a nominal amount. OTORA will be writing the check. This process should take about 4 months. The good news is that we have established that the American flag is allowed in the State right-of-way regardless of Caltrans' interpretation of the Ninth Circuit Court of Appeals ruling in Brown v. Caltrans. From the beginning I thought that Caltrans was just plain wrong. And just recently I discovered that Caltrans allowed a mural of Fidel Castro in the State Right-of-way by calling it “Transportation Art”. I wonder if Caltrans would have approved our Old Town Orcutt Veterans’ Memorial if I had submitted the project as “Transportation Art” and called the memorial “The Protectors of Our Freedom”. After all, that’s exactly what it is. The Old Town Orcutt Veterans' Memorial inaugural flag will fly first over Arlington National Cemetary. My name is Steve LeBard, and I am an American, Californian, proud war Veteran, and President of the Old Town Orcutt Revitalization Association (OTORA). 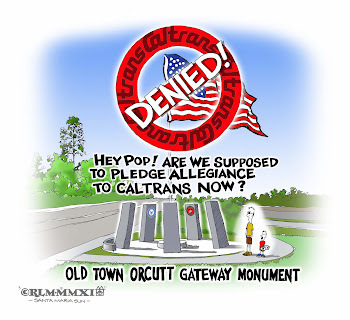 My town, Orcutt, California, was denied the right to fly the American flag and build the Old Town Orcutt Veterans’ Memorial because the California Department of Transportation determined the United States flag is an impermissible “public expression.” Both local and national media have covered our story and can be viewed at http://www.oldtownorcutt.com/. As you likely are aware, California borrowed the one star from the Texas State flag in 1846, just before California became a State. California saw that lone star as a symbol of Texas courage, something that our California Government seems to be lacking these days. A great California warrior recently gave me the California State flag after he and his men carried it into battle in the Iraq war. He too is very troubled that our government will not allow us to display our nation’s symbol of liberty. I will visit Austin just before Memorial Day and would consider it a great honor to hand over this California flag to you during my visit. Would you accept this California State flag, and hold it for safekeeping until the California Government has the courage to permit us to fly our American flag with pride? Thank you for your service to our Country, both as the Governor of Texas and as a United States Air Force Veteran. PROTEST RALLY SATURDAY, MAY 21, 2011 AT 2:00 P.M.
Protest Rally at the Park & Ride lot located at the entrance into Old Town Orcutt on Saturday, May 21, 2011 (Armed Forces Day) at 2:00 P.M. I talked to Senator Strickland's office Thursday and his Bill No. 443 does not look like it will get out the Senate Appropriation's Committee. The Chairman of that committee is Christine Kehoe from San Diego. She is a career politician, she was termed out of the State Assembly and will soon be termed out of the State Senate. She is most likely setting herself up to run for the Mayor of San Diego. Caltrans has a 4.5 billion dollar project in the works for San Diego and Kehoe has a Bill that is massaging that project. Kehoe was the only Senator to vote against our Veterans' Memorial and our right to fly the American flag in the Senate Transportation Committee. She chairs the Senate Appropriation Committee. Guess what Orcutt, if Kehoe has her way San Diego gets what they want from Caltrans, Kehoe becomes Mayor and we get nothing...no American flag...No Veterans' Memorial. Donate to the Old Town Orcutt "A TRIBUTE to the PROTECTORS of FREEDOM"
To donate to the Old Town Orcutt "A TRIBUTE to the PROTECTORS of FREEDOM" Please send your check to the American Legion Post 534, 145 W. Clark Ave, Old Town Orcutt, California 93455 or just stop by. Bill O'Reilly "California Balks at Public Display of American Flag"
FOX NEWS "California DOT Rejects Veterans Memorial Over American Flag"
see description on left "Design Elements"
I am announcing my candidacy for the position of California State Assembly District 35. I am pursuing this political position to change state law concerning the United States flag. Once in office there are other laws that I want to make just but I must start first with protecting the symbol of our nation. I have tried to fix this wrong at every level only to be let down time and time again. I believe that the state of California has lost her way. This political position will give me the necessary pay grade to make positive changes to existing state laws, introduce new bills and serve on committees that benefit all Californians and the United States of America. Website Design by Steve LeBard. Picture Window theme. Powered by Blogger.